All but two of the group set out from the almost non-village of Ribadiso at 7:30 a.m. We walked 15 minutes into town and stopped for cafe con leche and packaged donuts, the only items available that morning at the restaurant. We had donned our pack covers and ponchos because, yes, it was already raining steadily. In spite of the rain I set off with high spirits, enjoying the chatter of the teenaged girls. There were two adults on the walk that day, instead of three, one for the ‘fast’ group and one (me) in back to walk with the ‘slow’ group. The town quickly disappeared behind us. And in what felt like mere moments, the kids disappeared. It had been a fact for the entire walk so far that there were wildly different paces and abilities. It had been a fact that I was well suited for the slow group; I’d not only kept up with the slow group, but also occasionally slowed my own pace to be with them. But something odd happened this day. Within about half an hour even the slow groups in front of me had vanished. It was common to lose sight of walkers (caminantes) for a bit as curves in the trail were encountered or trees obscured the view. But this was something new. I realized that I couldn’t hear the echo of their voices. I couldn’t see flashes of their brightly-colored ponchos through the trees. They were gone. I was alone. We had told the students that the rules of the Camino for our group were these: never walk alone and always look behind you to make sure the other caminantes were keeping up. It didn’t take long for the rules to be broken that day, it seemed. First I was just angry. “Those damn kids think only of themselves; they’re not paying attention; they’re breaking the most important rule of the group,” I thought to myself. The anger helped me ignore the ankle that had begun to resemble a bruised cantelope and the knees that behaved as though they’d been transplanted from an octogenarian. I picked up the pace. I was going to catch up with those little imps. But the trail got steep again and the skies opened with a new fury, so it was futile. I wasn’t going to catch up. I could only hope that they would realize that they were missing a person and would stop to wait. I maintained this hope for about two hours, then gave up. No one was stopping to wait. It would be a day of solitude. I was not happy. Every footfall was heavy with resentment at being left behind. And every drop of rain into my eyes washed away the ability to see the opportunities of these moments. Eventually it became clear that stewing was a silly waste of time and I set about a mental readjustment. I’m alone at last! I can use this time to settle into the reflective thought I had planned on – I can finally consider my wild and precious life! I have arrived at my spiritual Camino! My reverie lasted for about 15 minutes until I slipped on a rock and twisted my already swollen ankle. It wasn’t a terrible twist, but enough to pop that little mind bubble I’d created for myself. Enough to re-awaken the feelings of misery about the weather (how much water can fall from one sky?!) and my lame limbs. About 3 hours into the day the rain abated somewhat and I realized I’d been walking with more comfort. The trail had leveled out and I had been, thankfully, lost in thought instead of counting every painful footfall. I sighed with relief and managed a smile. I came upon a ‘village’ (4 farmhouses hugging the trail) and felt not exactly happy, but content. Here I was in northern Spain, doing this thing called the Camino, having an experience like no other. It was quite something. Suddenly, I had a deep and intense feeling that something wasn’t right. And it wasn’t. The road felt too ‘road-y’. I hadn’t seen a yellow arrow in a while. Yellow arrows are painted on rocks, on the sides of buildings, or on the road all along the Camino and they mark The Way along with official markers that have a yellow scallop, the sign of the peregrinos. Sometimes the arrows are hard to find, the paint worn off by weather, but if you just stand still for a minute they appear in your vision. It’s kind of remarkable, actually. The thing is, I didn’t think I’d missed one. Before our departure we spoke with a colleague who warned us of the false arrows. These are arrows painted by people who wish to divert peregrinos from the Camino to force them to pass in front of their albergue or restaurant. This was the first I’d heard of such a thing and dismissed the possibility. I stopped in my tracks. I turned full circle to assess my surroundings. There were a few buildings, but none were hostels or restaurants and appeared to be deserted. There was a tiny farm up the road. I tried to calm the panic that was rising in my chest. I elected to keep walking ahead and see if someone were at the farm. I had to take advantage of the possibility of people. As I rounded a curve near the farm, I encountered a woman and her cows crossing the road. I asked her, “Am I still on the Camino de Santiago?” She gave a smirky grin, rolled her eyes and said, “Eh, mas or menos.” More or less? MORE OR LESS?! My face must have told the story of my weariness, so she softened. Rather, it was completely obvious that I was about to burst into tears, so she took pity on my pathetic, broken, wet self. She explained that I had gone ‘around’ some village or another instead of through it [followed a false arrow] and if I kept walking soon I would come to a church with a cross in the street in front of it. The cross ‘crosses’ the Camino, she said. It will be obvious there, she said, then tired of saying anything more and continued on with her cows. I followed her instructions and was happy to see the church she described (I was doubting…was she a pilgrim diverter as well?) and then soon saw the cross. It was a giant cross – perhaps 20 feet high – carved of rock with the Virgin Mary at the base, in the middle of an intersection. It was not obvious what to do, cow lady. There was no official mark of the Camino. There was a wooden sign painted with a caricature of a pilgrim, a yellow arrow and the words “Camino de Santiago this way” in English. I collapsed against the statue. I stared at the Virgin for some sort of sign, not that I believe in signs – or in the Virgin, for that matter. She gave me no signs. The wooden sign was clearly another diversion so I wouldn’t follow that arrow. I had to trust that the other way was The Way. Off I went. After about 1/4 mile I came upon two exactly parallel wooded trails about 15 feet apart. No yellow arrow. Another decision. Return to the cross or pick a trail? I thought I heard a car in the distance on my left, so I picked the trail on the left, figuring that I would walk to the next cross road and look for an arrow. If there were no yellow arrow, I’d have to return. The rain picked up and my ankle throbbed. Each step told me I was going the wrong way, but I had to check the crossing. When I reached the road and saw no arrow I let myself sob. Gasping, desperate sobs. I would have to retrace my steps. I’m lost, I’m so lost, I cried to myself. And if I’ve lost my way, what about the students? I began to choke on the worried tears gushing from me. What have we gotten ourselves into? Where are they? Where am I? Where am I? It was a literal question, but it was not lost on me (pun intended) that it was also a figurative one. I have lost my way. I have to take steps to be found, to find my way back. I was cogent enough to recognize the poetic aspects of this mess I was in. I walked back to the point of the two parallel trails. I stood there staring at them through my red, swollen eyes and runny nose, hoping that a previously-unseen arrow would reveal itself. And then I heard something. Nearby was a house I’d not noticed before nestled in some trees. An older woman was sliding open the window. She stuck her head out and shouted, “La derecha, chica. El Camino está a la derecha .” The right, girl! The Camino is on the right. I put my hands together and bowed to her as if in prayer and shouted back “Gracias, señora.” She shouted “Buen Camino” and slammed her window shut. I proceeded up the ‘right’ trail overflowing with gratitude for the woman who happened to pass by her window and behold the sad, wet figure in the poncho. Still, I was shaken and I knew I would not feel settled until I came upon the signs of the Camino. It was about twenty minutes before I came upon this, the most welcome sight of my entire trip. Perhaps the most welcome sight ever. 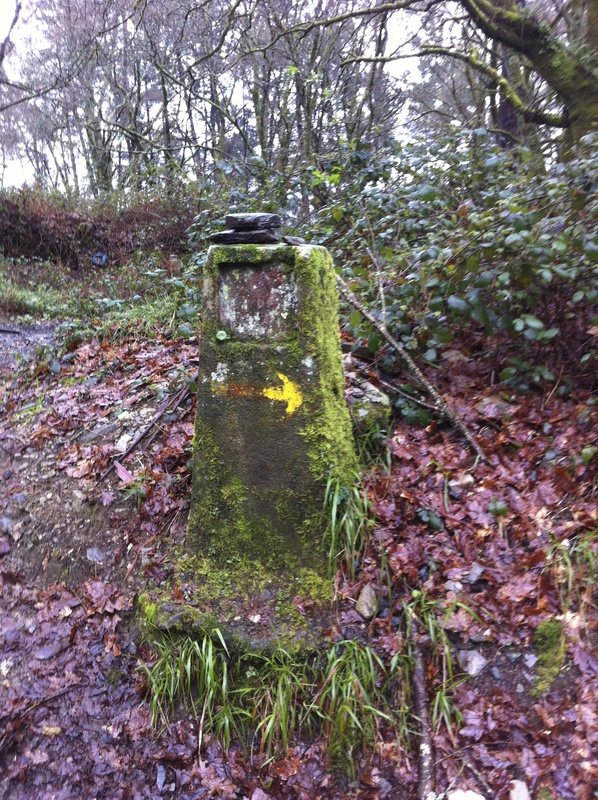 This is what marks the Camino, these stone markers with a scallop, an arrow and often the distance left to Santiago. I stopped here. Peregrinos say prayers or, if not prayers, something significant and place rocks on top. This was day 4 of the Camino and I’d never stopped to place a rock atop the marker, to pray. But here I did. I picked up a rock, squeezed it tightly in my hand and said a silent prayer of thanks. I am not a religious person, but this is as close to God, a god, the Universe as I have ever felt. I placed the rock atop this marker and wept. I let myself release everything that had built up on this Camino and long before it. I wept out my worry for the kids ahead of me who might also have lost their way and prayed all were well. I cried for the pain in my ankles, feet and knees. I cried for being as lost in my life and as I was on this day. I cried for knowing what’s terribly wrong and being too scared to fix it. I cried for wasted time and not knowing my way. I cried when I realized that this arrow was saying to me: This is the way, it’s going to be OK. You know what to do. Go now. So on I went, strangely heartened by this moment at the moss-covered relic. About two hours later I encountered another fork in the road with no yellow arrow. This time I stopped and stood there, very still, willing my heart to not pound, willing my head not to become cloudy, willing myself to choose calmly. A minute later there were footfalls behind me and the two in our group who had not begun the Camino with us that day appeared beside me. It was a moment that seemed miraculous to me. After 6 hours alone, suddenly they were there, as if they’d been there the whole time. “Hey, Lynette. What’s up?” I followed with, “Nothing, really, just wondering which way to go here.” They suggested we go left, so we went left. I was thrilled to not make the decision; at that moment any human could have gone in any direction and I would have followed. We walked for two more hours together into the town where we would stay the night. They told the story of how they decided they could indeed walk that day and I told a version of the truth of my walk that did not include blubbering, prayer and waiting for signs in the eyes of a stone Virgin. There are a few other facts to note of this day: a few students did get a “little lost”, but they were in groups and were only lost for a short period of time. The students didn’t actually ditch me. Each of the two last groups thought I was walking with the other, so neither knew that I had been left alone. By the map, I walked about 3 extra km, a total of 28km that day. It was the hardest day of my life, but the hardship was a gift I didn’t know I needed. This entry was posted in Uncategorized and tagged camino de santiago. Bookmark the permalink. I also got lost here two years ago- followed a bright yellow arrow, and came to a truckstop on a big road… I was not impressed! I didn’t know it was possible to get lost until it happened! And how disappointing that there are those who lengthen the already arduous journey so they can make a few euros. I had a similar experience years ago when I was hiking in Costa Rica, Lynette! While I was lost, I kept channeling the voice of Wolf Guindon, the wise man who had built the trail I was on. He used to say about hiking in the woods, “Sometimes you just have to spend another night on the trail.” I was not that calm while I was lost but fortunately I also did not have to spend the night on the trail! An extra night on that trail would have done me in! How did you find your way in Costa Rica?